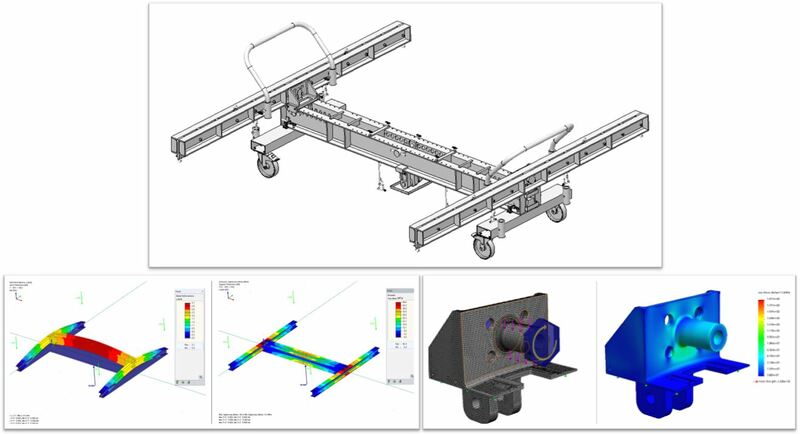 Mechanika Ltd provided a full design life-cycle stress analysis for the design of a bespoke lifting beam for carrying aerospace payloads up to 2 tonnes. Structural sizing was carried out at project initiation which was underpinned with FEA to show compliance with customer requirements and lifting code permissible stresses. From here, the customer was able to begin detailing the mechanized lifting beam, with continued stress analysis support from Mechanika Ltd, right the way through to Critical Design Review and manufacture. Mechanika Ltd also advised on the manufacture and material grade selection of all components. BS 2573-1:1983 Rules for the design of cranes. The lifting beam was assessed against impact and dynamic effects as well as proof load test configurations.